On “Linear Ball Bearings” with a Coefficient of Friction of .001 Click Here. On “Linear Roller Blocks” with a Coefficient of Friction of .003 Click Here. On “Black Racer Ceramic Linear Bearings” with a Coefficient of Friction of .04 (lubricated) Click Here. On “Minute Man Linear Bearings” with a Coefficient of Friction of .19 (Dry) Click Here. On “WDX Non-Metalic Self Lubricating Bearings” with a Coefficient of Friction of .2 (Dry) Click Here. Founded in 1976, LM76 has been a leading designer/manufacturer of low coefficient of friction linear bearings, slides and linear motion systems. 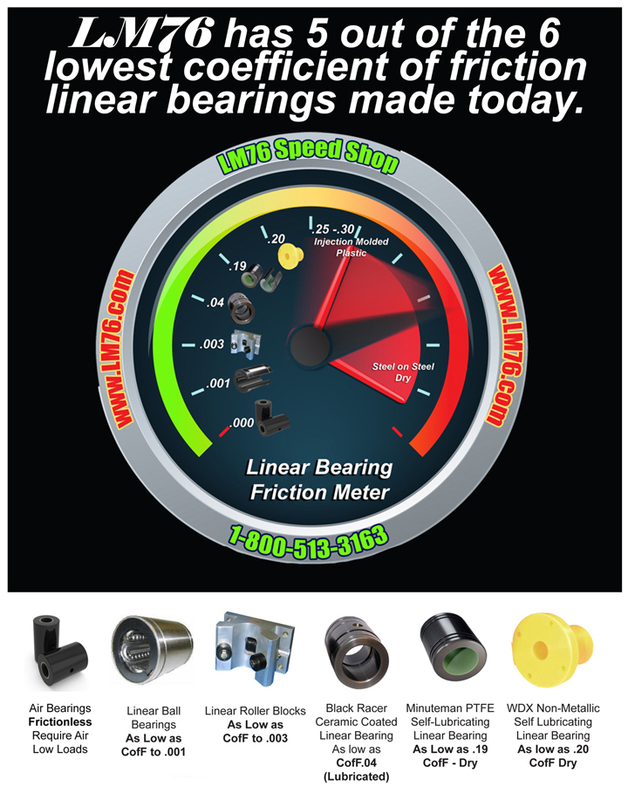 LM76 is renowned for its industry leading Minuteman Teflon® Composite linear bearings. LM76 is a leading supplier of precision linear shafting: RC60, 300 Series Stainless Steel, and ceramic coated aluminum shafting. LM76 also offers several FDA/USDA compliant linear bearings and slides for the food processing, pharmaceutical, medical, and packaging industries. « Motion Control – GAM Launches New Gearbox Sizing Tool!